I pretty much think the ShamWow commercials are the most annoying things EVER. And seriously, what's with the head set? Are you also on the phone? Are you trying to become the next Britney Spears? I do have to say that as much as the commercials drive me crazy, it's kinda like the Free Credit Report guy that puts amazingly rediculous yet totally catchy songs in my head all day. They totally brain wash me. I want a ShamWow. I guess today is my lucky day. Take a very short survey and you'll receive two ShamWow cloths absolutely FREE- no s/h. The survey is very quick. Thanks, Thrifty And Chic Mom! Free gallon of milk with a $100 purchase here. Free half of milk with purchase of a gallon of white milk here. Use zip 63090 if you don't see the coupons with your zip! MMMmm... Jamba Juice. 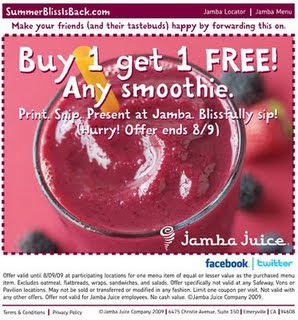 CLICK HERE to get a B1G1 Free Smoothie (any smoothie) coupon to use at your local Jamba Juice! Offer good thru August 9th. You can also follow them on Facebook or Twitter. 30% off your Old Navy, Gap, or Banana Republic purchase! CLICK HERE for a printable coupon to save an additional 30% off your Old Navy, Gap, or Banana Republic purchase! 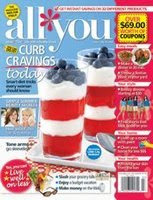 For only two more days, you can order two years of 'All You Magazine' for $16.00, which comes out to .67¢ an issue. This magazine is LOADED with coupons. We've referred to All You before, but it's been a while so if you are not familiar with it, it is a magazine sold only at Wal-Mart stores. (or directly through home subscriptions) Each issue is packed with high-value coupons, plus great articles, simple cooking recipes, home improvement and decorating ideas, organizing tips, and other great features for BargainMoms! Visit Carmella’s Southern Living at Home website--you must use this link to get the discounted price. Then just follow the screens through checkout. It takes about 8 weeks to receive your first issue once you see your payment post to your account. Typically, those who order in June should receive their first issue in mid-to-late August. DISCOUNT NOTE: The total will show $19.95 at checkout and on your invoice. Your discount adjustment will be made after you checkout but before your card is charged, and the final amount charged will be $16.00. This is because Carmella is offering the discount as an independent consultant. It is not at the corporate level, so the automatic response will not reflect the discount. Click HERE to sign up for $55 worth of coupons from Nabisco! Cheesecake Factory: 1/2 price Cheesecakes TOMORROW! Did you know that tomorrow is National Cheesecake Day? Sounds like the best day ever! The Cheesecake Factory is offering half price cheesecakes for Dine-in customers. Plus, the charity Feeding America (featured on the NBC Show, 'Biggest Loser') will recieve .25¢ for every slice purchased! Most Wal-Marts sell the super YUMMY Choco Tacos for around $1.00 each. Use the $1/2 Klondike coupon HERE or HERE to get them for .50¢ each, when you buy 2. It's Wednesday. Trust me. You deserve it. Teacher Appreciation Day August 8th from 9-noon. First 100 teachers get free gift. Staples multipurpose paper 10-ream case $24.99 after easy rebate. Limit 2. Double, Triple and Quadruple Coupons this week! See the entire Fry's list here. Save $4 instantly every time you mix and match any 4 participating P&G products using your VIP card. *$4 savings is on the non-Proctor & Gamble products in your purchase. Valid 7/29-8/11. All purchases must be made in a single transaction. Click the store name to view the full list of deals and coupon matchups. FREE pink shopping bags for breast cancer. every time you use your bag! Here are the "best" deals. Some stores are currently doubling, tripling and quadrupling coupons this week. Please let us know if your store is included and what location. Thanks! Fry's Milk, 1/2 Gallon .77¢ ea. (limit 4 per transaction)--You can freeze milk! Case of 8=$4.00 or .50¢ ea. Case of 24=$10.56 or .44¢ ea. Case of 9=$17.91 or $1.99 ea. Kroger Peanut Butter, Creamy or Crunchy, 18oz. Case of 12=$12 or $1.00 ea. Case of 10=$17.50 or $1.75 ea. Case of 12=$11.88 or .99¢ ea. Case of 12=$10.56 or .88¢ ea. Case of 12=3.96 or .33¢ ea. A deal for Arizona D-Backs Fans! My friend, Andrea just emailed me today about this totally awesome deal from the Arizona Diamondbacks and Taco Bell. 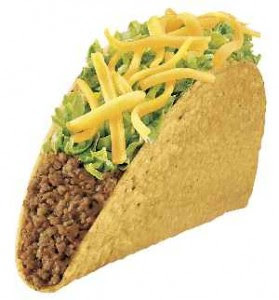 It's like Taco Bell and the D-backs got married and had an awesome baby. Every time the D-Backs score six runs or more, you can get three free tacos at Taco Bell with the purchase of a large soft drink. All you have to do is go in and ask for the Diamondbacks Special 4-6 p.m. the day after the game. No, you don't have to have been at the game or have to have a ticket stub. Yep, it's true. And it's directly out of the Tribune. I got an email from a new blogging friend today about a great deal she found on clearance candy at CVS! She found Valentine's Day M&M's (12+ oz bags)on clearance. She used the $1 off 2 coupon and got lots of FREE M&M's!!! Let us know if your CVS also has Holiday candy on clearance. I love finding deals like this! Thanks, Janae! Go here to print a coupon for free Chiquita Apple Bites Single pack and a coupon for $1 off any Chiquita Bites Family Pack. You can print these twice! If you haven't heard of Disney Movie Rewards yet, then you have been missing out on some easy and FREE prizes from Disney! There are two ways to earn: when you buy DVD's or go to Disney movies. All you have to do is register (Registration is free) at DisneyMovieRewards.com and when you buy any Disney DVD's, inside of the case is a little paper which has a "Magic Code". All you have to do is plug in that code and you earn 100 points per DVD. They have a lot of great prizes that you can exchange your rewards for and they add new ones periodically. You can earn more free movies, posters, collectibles, blankets....all kinds of Disney swag. I took a minute to sign up for it today and went through my Disney DVD's that were laying around the house and I was able to get 2000 points just from DVD's that I have bought over the past several months. (What bugs is that I would have more, but my kids take the little papers out of the DVD's and play with them, so I am missing a bunch) If this happens to you and you lose your code or your case is empty, all you have to do is keep your receipt, log into your DisneyMovieRewards.com account, print off their mail in form and wait to receive credit! You also get credit for going to Disney Movies in the theatre! Just keep your ticket stubs, print off their form and mail it in with your ticket stubs! You might as well get credit for things you were going to spend money on anyhow. Wanna earn extra points? They have surveys and refer a friend benefits as well. PLUS they have special promotions and offers for you as a member of their Rewards Club. For example, today I got a free phone call from any Disney Princess for one of my girls who's birthday was this weekend. COMPLETELY FREE. What little girl won't love that? There are also links to all different kinds of Disney features like games, online shopping, FREE printable pictures, FREE downloadable wallpaper, desktops, iron on's etc. Plus it keeps you up to date and informed on all of Disney's latest and greatest ventures. Trust me, it's worth it. What are you waiting for?! Start Now! I was just telling myself that I needed to do a Costco run for photos so I am excited that CVS has a good thing going on right now! When you sign-up for CVS Photo Center, they are going to give you 50 FREE 4x6 Photos! It's FREE to join. Just go HERE.